The first unit of the Kudankulam Nuclear Power Plant (KNPP) will resume power generation by the first week of December, an Indian minister said in a written reply to a query in the parliament. Operations were temporarily halted in October when a malfunction was detected in the turbine of the unit. The minister added that measures were being taken to avoid a repetition of such a scenario for the second unit of the plant, which should attain criticality in December. The turbine generator of a nuclear power plant is not part of the so-called nuclear island of the plant. It is an ordinary piece of equipment similar to that commonly used in other, non-nuclear power plant. 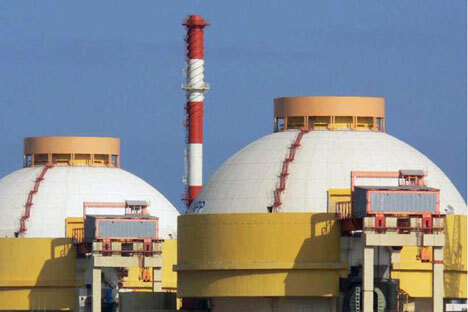 The Kudankulam units comprise of 1,000 MW reactors of the VVER-1000 model being constructed by the NPCIL and Russia’s Atomstroyexport company, a Rosatom subsidiary. India signed a contract with the Soviet Union to build the Kudankulam plant in 1988, while the actual construction started only in 1997 due to due to the political and economic upheaval in Russia after the collapse of the Soviet Union in 1991. Although, the plant has faced foreign-backed protests in safety issues, leading Russian, India and international scientific experts have vouched for the safety of the project. The experts have maintained that superior technology and exceptionally high quality equipment used in the reactors at the project made them unique in the global nuclear industry. KNPP is the first pressurized water reactor that belongs to the light water reactor category in India.